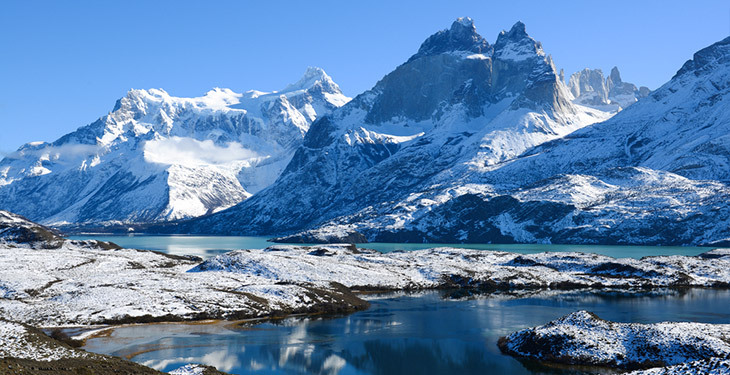 Explore Torres del Paine National Park in the winter. Discover the beauty of Torres del Paine National Park, trekking through Paine Grande to the Las Carretas Trail, witnessing Grey Glacier. 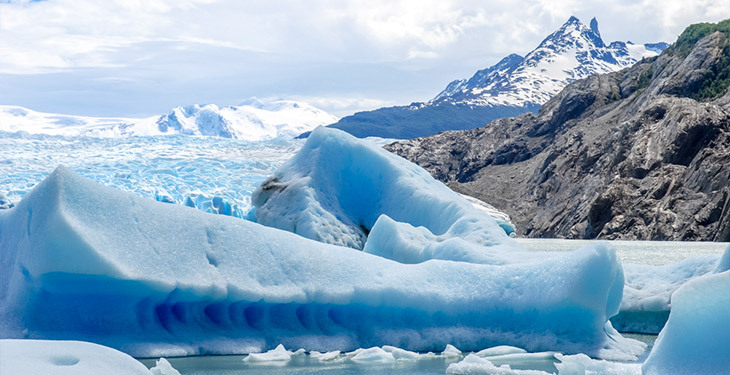 See the magic of Torres del Paine National Park and soak up the winter wonderland surrounding you with the stunning views of snow-covered mountains and the turquoise lakes and fjords of the region. 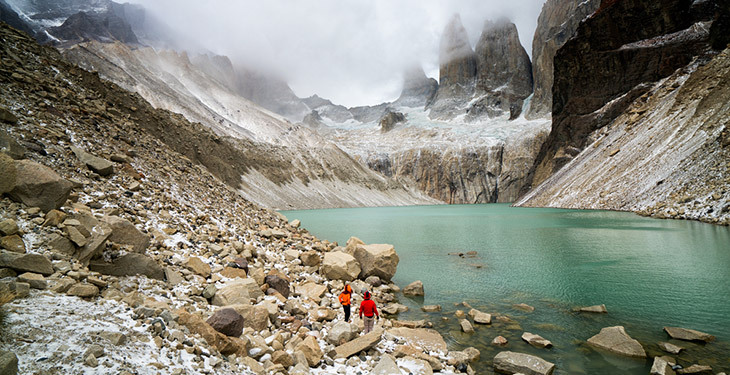 Begin your trek from the trailhead of Torres del Paine to the granite Three Towers and the emerald lake. 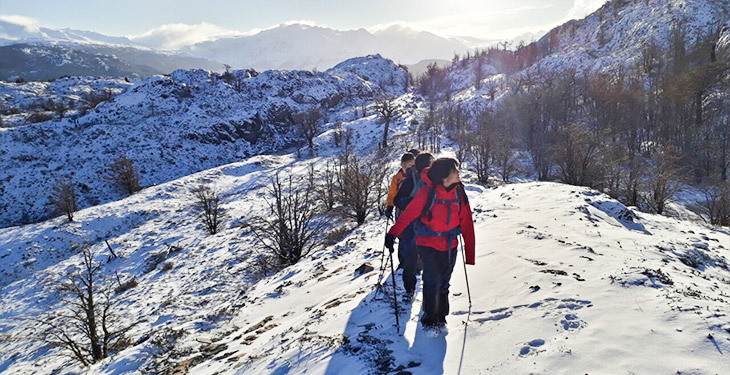 Spend your evenings in the Serrano River Valley where you'll sleep at a refugio and awake to the peaceful snowfall of Patagonia in the winter. The snow-capped peaks and winter wilderness will surround you on this 30-mile trek through the snow-covered lenga forest. Witness the rugged and jagged mountain peaks above you as you make your way to Paine Grande through the Las Carretas Trail. Gain elevation, hiking up varied terrain to the French Valley and take in the rewarding views. Trek to Grey's Glacier and witness the ice field that is located on the west end of the park. 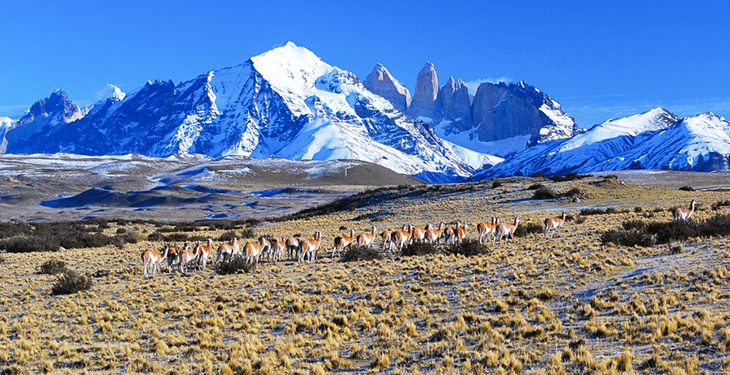 Ultimately, soak in the winter scenery of Patagonia while experiencing an amazing trek. This trip includes accommodations, meals along the trail, transportation and transfers, and medical and evacuation insurance for all participants confirmed 30 days before the expedition. Arrive in Puerto Natales and meet your guide at OneSeed's partner B&B in Puerto Natales. Review the welcome packet and complete a gear check then head to a local restaurant for a welcome dinner! Take an early morning van from Puerto Natales to Torres del Paine National Park (2 hours). On the way to the park, soak up the winter wonderland surrounding you; see stunning views of snow-covered mountains and the turquoise lakes and fjords of the region. Then begin your trek! Hike from the trailhead of Torres del Paine to the granite Three Towers and the emerald lake (probably frozen!). End the day in the Serrano River Valley where you'll sleep tonight. Rise to the peaceful snowfall of Patagonia in the winter, free from the crowds and immersed in the pure winter wilderness. Continue through the park and make your way through snow-covered lenga forests. Catch views of the jagged mountain peaks as you make your way to Paine Grande through Las Carretas Trail. Depart Paine Grande for a gorgeous day hike to the French Valley. After a steady climb, see an impressive viewpoint of the French Valley, Cerro Hoja and Cerro Máscara, two of the famous horned peaks. Along the way you may see guanacos (a relative to the alpaca), condors, foxes, and eagles. End your day back at Paine Grande. Hike to Grey Glacier, an impressive ice field that covers the west end of the park. Enjoy the beauty of Pehoé Lake and Grey Lake as you approach the glacier. Tonight, sleep a second night at Paine Grande. Spend one final half day in the park. Relax and soak in the last winter views of Torres del Paine. A short three hour walk to Pehoe Lake will take you via catamaran out of the park. 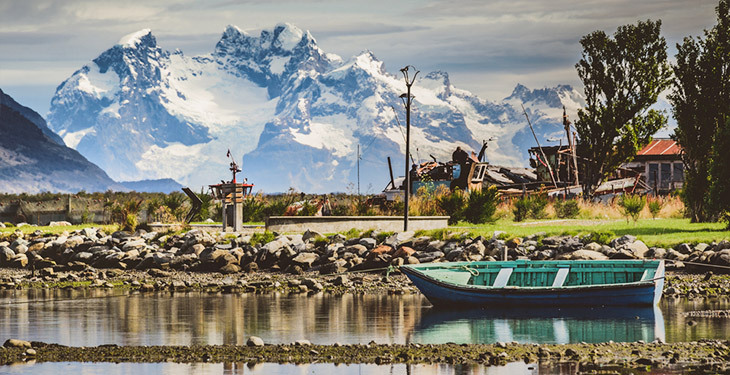 Meet your van and take a scenic ride back to Puerto Natales. Share a farewell dinner with your guide before a restful night at the partner lodge. Complete the expedition by 1:00 pm and say goodbye to Patagonia! 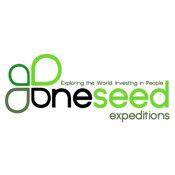 OneSeed Expeditions offers a new way to travel. They partner with local communities to ensure that tourism revenue goes directly to the guides, porters, and local entrepreneurs. Through the OneSeed Fund, they invest 10 cents of every dollar into microfinance initiatives that provide start-up capital for women entrepreneurs. OneSeed practices Leave No Trace principles on all expeditions and they incentivize environmental best practices among their partners. Above all, OneSeed Expeditions is committed to operating with respect and mindfulness everywhere they travel. I traveled to Patagonia, Chile this past November and the accommodations, food, guides, and trek truly exceeded my expectations. The company took care of all the planning for transportation and stays so it was great to not have to worry over all the details. Went on the Epic Patagonia trip this December and the whole experience was amazing! Absolutely stunning scenery, both our Jorge’s ;) (our 2 guides) were so knowledgable, thoughtful, and generous, and every detail of the trip went off seamlessly - highly organized. I went on the Epic Patagonia trip with my whole family and had an absolute blast! OneSeed did an amazing job with all the logistics involved (and there were a lot - flights, buses, lodging, meals, etc). And our guides (Sergio and Jorge) were the best. You can either fly directly to Puerto Natales or fly to Punta Arenas and take a bus to Puerto Natales. Flights to Puerto Natales are infrequent and often expensive so your best bet is to fly to Punta Arenas and then bus to Puerto Natales. Two popular bus companies are PasajeBus and BusSur. OneSeed provides affordable loans to women living in poverty by investing 10 percent of revenues in trusted local microfinance banks. The unique nature of these expeditions will take you off the beaten path and allow you to explore the communities supported by OneSeed. How physically challenging will the trekking expedition be? What should I expect? This adventure has a difficulty rating of intermediate. Expedition difficulty is determined by number of hours walking per day, elevation gain, trail quality, etc. Intermediate adventures require that you are at least at an average fitness level. Activities will be mandatory and occasionally physically demanding. Experience in this sport is not necessary. This is a great first trek and a perfect fit for people looking for a challenge without daily exhaustion. Typical days (depending on the particular itinerary) range from 3 to 9 hours of trekking. Elevation gain will be gradual and pacing reasonable for people with a bit of hiking experience. Pricing is based on double occupancy (shared rooms) in hotel and refugios, which are mountain lodges scattered throughout the park. Sleeping arrangements are bunk beds in a dorm-style set-up. Bathrooms and showers are shared. Meals are cooked in the refugios and served in the main room (around the stove, where everyone relaxes after their hike). Pricing is based on double occupancy (shared rooms) in hotel and refugios (mountain lodges). If you're a solo traveler, OneSeed will try to pair you up with another solo traveler of the same gender, but if this is not possible, you'll need to pay a $150 single supplement to OneSeed Expeditions for your own room. Food on the trail is rich in carbohydrates and protein since you'll be burning calories like a champ. Breakfast at the refugios may include eggs, fruit, cereal, lunch meat, cheese, toast, coffee, tea, and juice. Lunch is usually a sandwich made by your guide in addition to fruit, snack bars, and some chocolate. Dinner may include meals like chicken with mashed potatoes, pasta, beef and rice, salad, soup, etc. While extra snacks are not included, you'll have plenty of food during the trek. Travelers also have the option of purchasing snacks at the refugios, so having extra cash on hand is helpful. OneSeed recommends that vegan travelers bring extra protein bars. OneSeed is able to accommodate most allergies and dietary preferences, just let them know in advance. It is recommended that you purchase trip cancellation insurance, which is NOT included in your cost. Travel insurance allows you to seek reimbursement if you are forced to cancel your trip for unforeseeable reasons, or if you need to cover medical help, emergency transport, and/or theft or accidental damage while traveling. We recommend World Nomads as a provider.